It’s time to share a secret: you don’t have to wait until the summer to enjoy tomatoes. I know a way that you can enjoy dishes that feature tomatoes all year round, without having to endure the anemic, mealy globes that pass for tomatoes most of the year. Think it’s impossible? I’d be skeptical, too, if I hadn’t been enjoying the secret all winter long. Why now? Well, because spring fever isn’t just about ditching the jacket, getting into lighter clothes and being outside more. It’s also about the promise of fresh, seasonal bounty. Around this time every year, I get ready to start savoring my favorite fresh foods. I make a long list of light and bright dishes that I want to make, and then realize that tomatoes aren't part of the fun. I want them to be ready, but there are still many months before the good ones show up at the farmers market. It’s kind of like when you swap your winter clothes for spring threads in early March, only to remember that March is still a little chilly. Drum roll!! The secret to enjoying tomatoes all year round is roasting them! That’s right: roasted tomatoes. I like using the grape or cherry variety, which come out juicy, sweet, succulent and bursting – literally – with flavor. While roasted tomatoes require more work than slicing into a fresh one, making them is almost entirely hands off. Plus, you can make them days ahead of time. 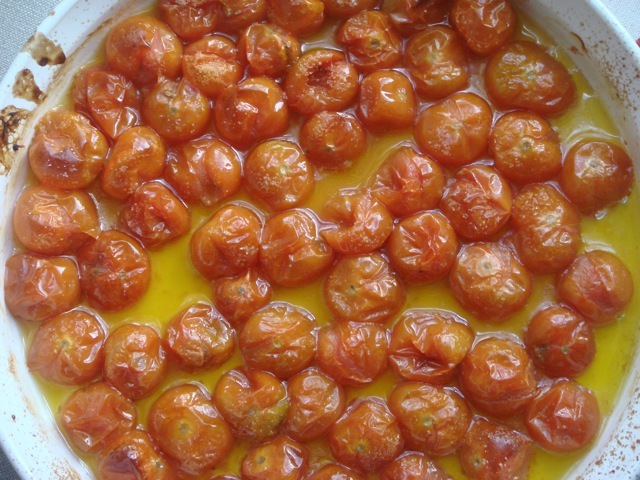 I often roast 2 pints of cherry tomatoes and store them in an airtight container, with the oil in which they cooked, for use during the week. It makes dinner a snap. At first I only used roasted tomatoes the way I would other cooked tomatoes: tossed with pasta or rice, served over polenta, eggs or simply prepared meat or fish, on pizza or bruschetta. Then I started experimenting by using roasted instead of fresh tomatoes. I mixed them with tuna salad, in a white bean salad and even in a green salad. Great, great and great. Then I tried the ultimate: I used roasted tomatoes instead of fresh in a caprese salad (pictured up top). 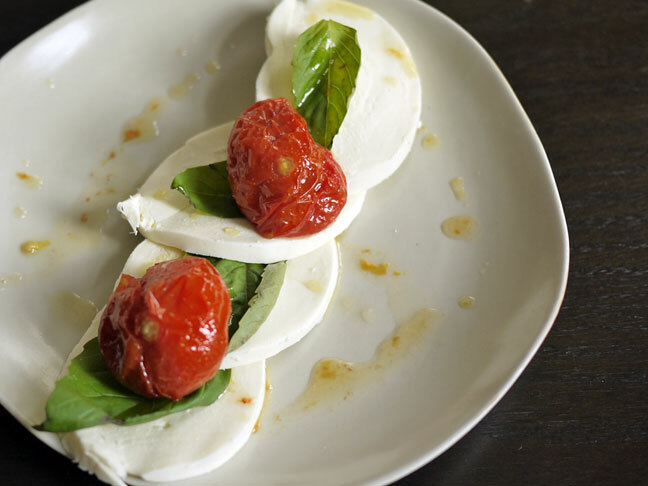 You know, the salad that’s ALL about good fresh mozzarella and great fresh tomatoes. It was delicious. So, there you have it. An essential cooking secret that'll get you through winter and spring. And maybe even summer; I once roasted tomatoes with peaches smack dab in the middle of summer tomato season. They were perfect piled on top of grilled veggies. They worked even better than fresh ones. 1. Preheat oven to 400 degrees. Place tomatoes in an oven safe dish with oil and salt. 2. Roast for 45 minutes or until the tomatoes have all burst open. You want them to be popped, but still juicy. You also want them to be just caramelized in spots. Serve any way that you can imagine.